If you want to import from this side, or any text examples here, you can import Commands / Texts in the program QTP from version 4.51 ! 1.) ... Insert Text / Commands via clipboard! 2.) ... Prepared Windows Z menu as an alternative to the Windows-X menu! ► is in QTP from 4.51! 1.) Insert Text / Commands via clipboard! (Image-1) Import from the clipboard text and commands! Adding Clipboard Text and Importing Windows Commands into QTP is a breeze as you can see above in Windows 10 shot screenshot. 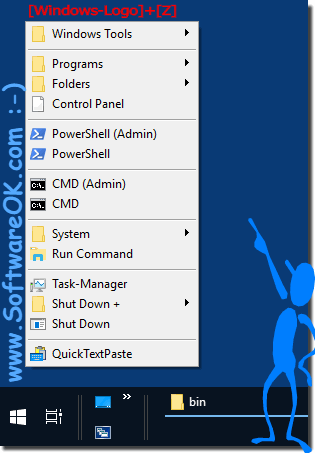 The nice thing about importing Windows commands from the clipboard to QTP is that you can use it without hesitation even on older versions of MS Windows operating systems, whether it's a Windows desktop, on the go on the tablet, Surface Pro / Go, or even a server Area as Admin on MS Web Server OS. 2.) Prepared Windows-Z menu as an alternative to the Windows-X menu! (Image-2) Windows-Z alternative to Windows-X Menu! text_007=L-Win+Z=runx:"C:\Program Files (x86)\Microsoft Visual Studio 9.0\Common7\IDE\devenv.exe"
QuickTextPaste - FAQ-34: Import from the clipboard text and windows commands!